Yes, it is Bob, back with a new blog. The day itself seemed doomed from the start though. 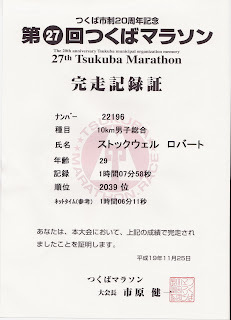 I woke up on time and drove to Tsukuba (apx 1hr away) leaving myself plenty of time to register. However traffic was backed up trying to get to the parking lot and not moving at all. The 10km race started at 10:20, but registration ended at 9am, and I was still still 2km away from the parking lot at 8:30. "My first actual race since gym class in high school and I'm going to miss registration and have to sit on the sidelines" I'm thinking to myself. Then for some reason I wonder if I will have to pay for parking and decide to get my wallet out since I don't have anything better to do. Because my wallet was not in my pocket, it was sitting back at the apartment on the computer table. My wallet that has my driver's license in it (so I'm driving without a license), my wallet that has my money in it (so I'm TSOL if I want to buy a sports drink or something), my wallet that has my foreigner registration card in it (so if a cop stops me on a BS gaijin-check I can contribute to the "rising foreigner crime rate" by not carrying it, in addition to possibly getting arrested). That's why it's great to be married: the bride had money, her driver's license so she could take over, she didn't have my registration card but I figured I'd chance it and everything was good again. Except for that whole 30minutes until registration closes and stuck in traffic thing. With the bride at the wheel, I decided to let her park the car and I took off (what else?) running to get to the race on time. Registered with 5minutes to spare. All and all it was a good warm-up for the race and now have my first official time. When is the next race you ask: February 3rd at the Ome marathon- next time 30km!! !